Compare the output, design and manufacturer’s guarantee of the pumps you are using against HS PUMPS, you won’t take long to conclude……. 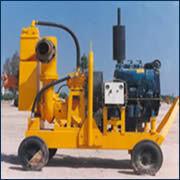 HS PUMPS are the most reliable and cost effective pumping sets for portable use. And the are easy to maintain. Backed by years of engineering and manufacturing expertise HS PUMPS are made in U.A.E. to the highest quality standards using corrosion resistant materials and performance proven components throughout. In fact quality is built in at every stage of production beginning with planning and continuing through to delivery, because we know that the interchangeability and durability of parts is most essential for making high quality, heavy duty HS PUMPS. And besides all this a customer service department with complete spare parts inventory is always there to provide technical assistance to customer on site at any time. This is why civil engineers, builders, contractors, local authorities and industrial units all rely on HS PUMPS for top performance. And they know that 100 percent replacement parts are readily available LOCALLY. ensure a smooth operation throughout its long working life. bearings, housed in a robust cast iron housing. to achieve a high vacuum efficiency for automatic priming and repriming on intermittent flow. performers under local site conditions. - Performance proven heavy duty mechanical shaft seal having seal faces of silicon carbide and having heat resistant O-rings. - Chassis is mounted on four solid rubber wheels and incorporates a fuel tank sufficient to keep the pump running for 24 hours or more.